DC's animation studio have struggled in certain areas over the past few Batman-centered releases, receiving mixed reviews in their depiction of the Caped Crusader and his relationship with Damian Wayne, his son and the new Robin. Son of Batman strained to adapt Grant Morrison's take on the father-son dynamic duo, unable to contain the brooding and overpowered nature of the superhero's young spawn. Batman vs. Robin improved upon those issues to a degree, yet it also dropped the ball while incorporating Damian into a hastily-done take on the Court of Owls, the conspiratorial puppet-masters at the heart of Gotham City. Batman: Bad Blood follows through with the third installment in this continuing arc, but it takes a different approach by incorporating a host of new heroes -- the start of a family -- responding to the disappearance of Batman, thus also diverting some of the attention away from the young Boy Wonder. Despite its persistent action, too many new, rushed heroes and an afterthought of a main plot keep director Jay Oliva's latest from taking off. Bad Blood starts off with fireworks, as many of DC's animated works do, but they occur around the crime-fighting initiative of a red-and-black, long-haired, gun-toting hero, Batwoman (Yvonne Strahovski), and how Gotham's protector arrives to help her out of a tough spot against a host of new enemies, led by the brawny and knowledgeable Heretic (Travis Willingham). 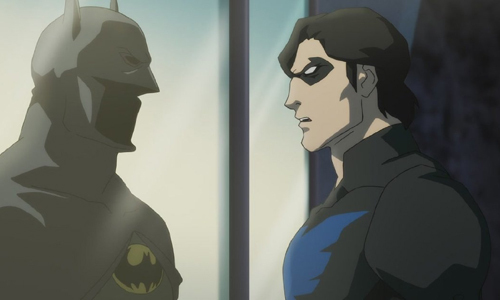 When Batman (again played by Jason O'Mara) disappears during the explosive battle against this formidable new force, leaving the city of Gotham exposed for quite a while, those closest to him begin operating in contingency mode to fill in the gaps until they learn of his fate, forcing his former protege Nightwing (Sean Maher) and son Damian (Stuart Allen) to preserve the illusion that Batman's still around and on-watch. While both are capable crime-fighters, their efforts can only go so far and don't go unnoticed ... notably by Batwoman, whom Batman saved during their fight. Coupled with another new hero, Batwing (Gaius Charles), the group of allies search for Batman while combating The Heretic and his henchmen. Bad Blood faces a similar dilemma to that of the upcoming film Batman v Superman: Dawn of Justice, where incorporating a range of new characters into their respective universes has to mesh with a coherent, purposeful story. The big difference, beyond the fact that more people have heard of Wonder Woman than Kate Kane, is that Zack Snyder has a full-length feature runtime to cram in exposition, whereas Jay Oliva and his team must fit everything into the traditional 75-minute space of their animated films. It's a challenge that proves too daunting for the limited time, resulting in a hasty and clunky introduction to Batwoman's harrowing past and sexuality -- what's otherwise a compelling narrative fleshed out in Greg Rucka's Elegy collection of books -- and an even more cumbersome introduction to Luke Fox, the brilliant and military-seasoned son of Lucius (Ernie Hudson). Both of them fight for attention alongside a continuation of Damian Wayne's growing pains as Batman's apprentice and Nightwing's struggle to get out of his teacher's shadow, none of whom get the time needed for their characters to expand beyond their surface-level traits. That's because the script from J.M. DeMatteis, who also wrote Batman vs. Robin, works toward developing this DC Universe's version of the "Bat-family" as quickly as possible, cobbling together a narrative inspired by comic stories -- Batman: Battle for the Cowl and Batman: Incorporated -- that bonds together heroes inspired by the Caped Crusader. DeMatteis spends so much time on new characters and gathering them together that he neglects the fabric of the plot itself, a perfunctory spin on what'd happen if Batman / Bruce Wayne were presumed dead. Something had to be sacrificed to make it work in such a short span, and the void can be spotted in the lack of a compelling threat, one with obscured stakes and a villain who's essentially a clone of long-time nemesis Bane: a smart, tall, muscled biological enigma with personal insight into Batman. Combined with clunky references to DC's prior animated films, lower-tier henchmen from the Rogues Gallery, and a lack of levity -- aside from a joke about ninja nuns -- and we've got an underlying story devoid of Batman that meanders and rapidly loses steam. A lack of action isn't the problem, either: Bad Blood packs a wallop with hard-hitting set pieces and tense sequences that embrace the unearthly capabilities of its eclectic characters, from electrical strikes to mind-control. Visually, the DC Universe's installments continue to evolve in the action department, emphasizing bodily impact in the hand-to-hand combat and pulling back on explosions to create impressive animated displays, boasting impact rivaling even Hollywood productions. Yet, this escalation in bravado moves forward without elevating the real importance of what's going on, doggedly relying on the formulas of DC's prior animated films and Batman's no-kill policy for overused thematic gravity. It doesn't help that the action occasionally goes overboard with a lack of practicality, especially when it comes to young wunderkind Damian, who fends off massive -- we're talking massive -- foes without too much trouble and dances around machine-gun fire that's hot on his heels. Eventually making some sense of the title with plot twists and peculiar representations of past characters, Bad Blood continues to throttle forward as if it's a vehicle merely designed to transport its brainstormed components into the warzone of Gotham City, tossing these new and old players into the fray all geared up and ready to appear in future adventures. There's nothing wrong with that, but it should be more inconspicuous and captivating than what materializes in this obligatory search for Batman, which rarely appears to have a purpose beyond these necessary introductions and developments to progress the meager plotting. The final shot should be one of invigoration, inspiring excitement about the possibilities of what this new Bat-family could accomplish with a unified goal and moral barometer, yet director Oliva can't shake off the sensation that everything in Bad Blood has different objectives than telling a cohesive story in the vein of Under the Red Hood or Justice League: Doom.